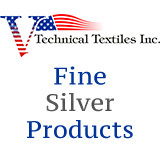 Silver Plated Nylon 66 33/12 dtex Z turns Conductive Yarn. Approx. One pound.